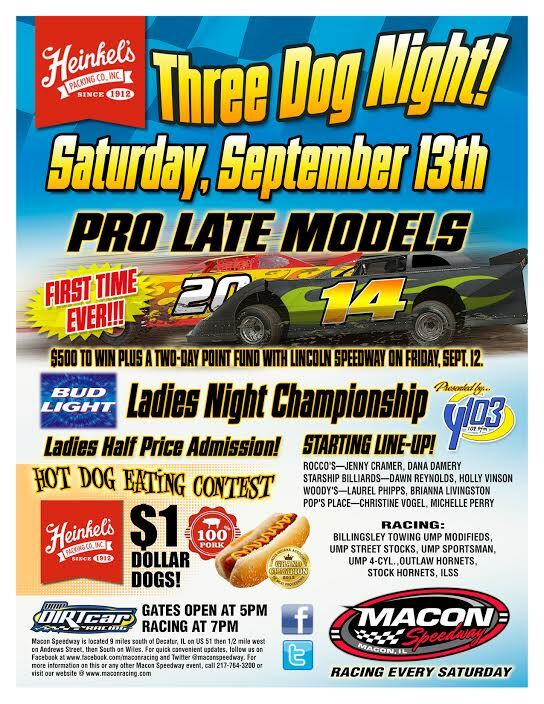 Macon Speedway added Pro Late Models to the action including a $500 to win feature. The field will also be competing in a two-night point fund combined with the action at Lincoln (Ill.) Speedway Friday. The point fund winner takes home an extra $400, with second place getting $200, third grabbing $150, fourth taking $100 and fifth and sixth heading home with an extras $75 apiece.Billingsley Towing Modifieds, Street Stocks, Sportsman, Outlaw Hornets, Stock Hornets and the Illinois Lightning Sprint Series will also race. Grandstands open at 5 p.m. with racing at 7.